It has been almost a year that our coop build was started. 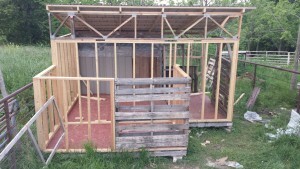 With a lot of help from family, the coop finally took shape and is now working very well. I will recap the process that we used to decide what coop to build and how we built it. We wanted a multi use chicken coop. I personally wanted a coop that we could have separate breeding pens for different breeds, plus a main section to house our layers. Our end goal was to be able to be somewhat self sufficient and have the ability to breed, hatch, and raise our own chickens. After weeks of looking at coops on the internet and purchasing a book on coop plans we made our decision on a plan. 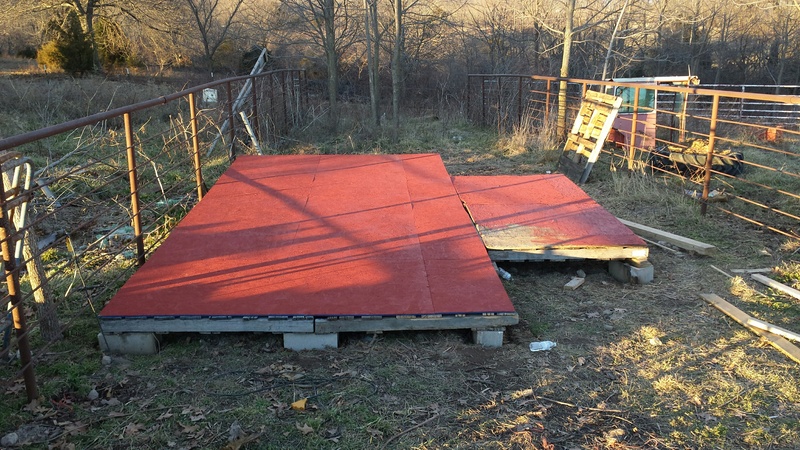 We chose a coop that had a 10′ x 15′ center section with two 10’x5′ lean-to areas, one on each long side. 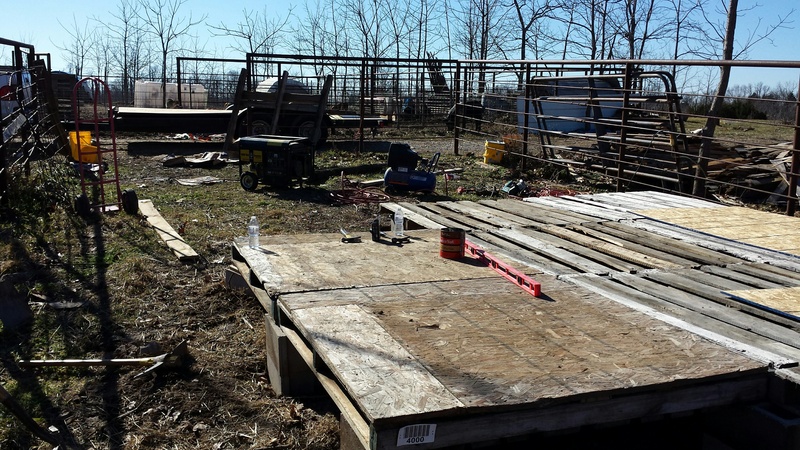 The center section would be for our laying hens and the two side pens could be used for breeding, isolation, brooding, or acclimating new birds. 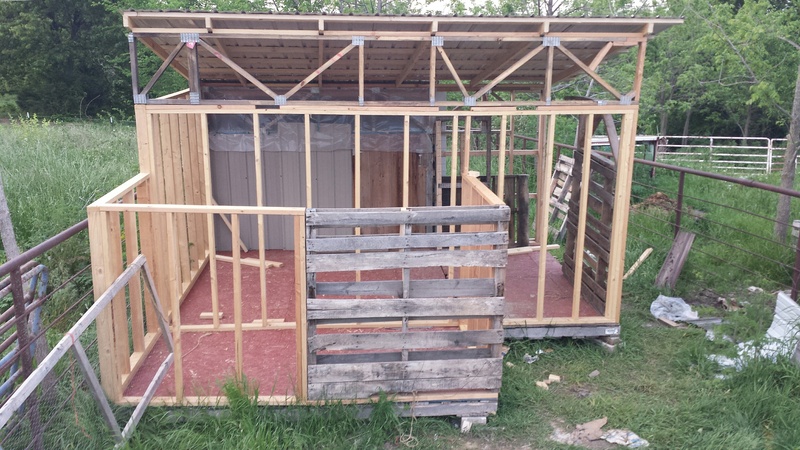 We chose to use as many wood pallets as possible in the framing to cut down on cost, and to use a steel sheeting exterior to make it maintenance free. We started our build with 5’x5′ wood pallets to make up the floor. Our coop dimensions were limited by, and directly planned according to the pallets we had on hand. Our site was on a slight slope so we used cement blocks under every corner of every pallet as support and to level the floor. We nailed, and screwed the pallets together the best we could to tie the floor together. the struggle was in tweaking the used pallets into square so they would fit together. Not all of our pallets fit perfectly together but for the price they worked great. We then covered the floor with a layer of 1/2″ particle board sheeting. 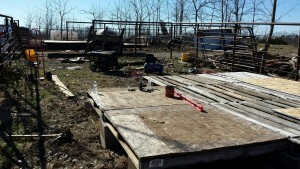 This served to tie the pallets together and to give the coop a solid floor. We painted the flooring to help against moisture and because we know it would be in the elements until we got the roof on. We found some metal barn sheeting at a discounted price. We located a construction company that sold their left over sheets and cover sheets for small projects. The panels were mixed colors and sizes, but that is how our whole project was anyways. We put the darker colors on the north side and the lighter panels on the south to try to keep the sun from heating up the coop too much in the summer. We even had some silver ones that we used for the roof. After all of the steel was up, it was time to finish the interior. We separated the 3 sections with chicken wire and put in doors, we added one outlet and Led light with a switch by the door, and hung the nesting boxes and roosts. All we lack are the doors to the outside runs that we have yet to build. We have successfully hatched out 2 clutches of eggs collected from this coop. One clutch was a barn yard mix and the other came from one of our side breeding pens of pure Barred Rock Stock. 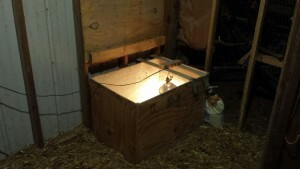 I added a brooding box with a heat lamp to one of the walls. The box can be removed for cleaning and the lid secured out of the way when not in use. All in All we are very happy with how are coop turned out. I know we will be able to use this for many years. And the 3 section design is perfect for our farm as we grow.